The chainsaw is a time-saving tool, which can be used to complete a number of high-powered tasks outdoors. Whether you’re removing huge branches or cutting your way through large logs, you can use chainsaws to work as efficiently and as quickly as possible. With brands including SGS, Ryobi and Milwaukee, we have a particularly large range of chainsaws for sale, making us ideally placed to supply a product that meets your needs no matter how big or small. From powerful and time-saving petrol chainsaws to cordless options that are flexible and as green as your lawn – we have them all. Capable of cutting in awkward spaces, each of our products deliver optimal performance and make the task of maintaining your outdoor space far easier. Whether you’re an amateur or a professional gardener, you’ll know that working outdoors can be extremely hard work. Our range of chainsaws reduces the labour required to complete even the most challenging jobs, while cutting the time taken to create the garden of your dreams. It’s the diversity of our range that really sets it apart, as we offer affordable electric and cordless chainsaws alongside more expensive and fuel-powered alternatives. This means that you don’t need to spend over the odds or buy an incredibly powerful chainsaw for a relatively straightforward job. We also stock a range of chainsaw parts and accessories including blades, chain oil and replacement chainsaw chains, so you will never be caught short. When you shop with SGS, we’ll also back the quality of our chainsaw with an extended two-year warranty. This will provide you with genuine peace of mind, which is important regardless of how much you spend on one of our products. Not only does our chainsaw range offer something for everyone, but we’re also proud to provide all of our customers with outstanding levels of customer service. 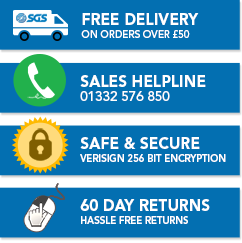 Don’t feel the need to rush your order and qualify for this offer, as we have a dedicated team on hand to answer any queries that you may have. Whether you’re a complete chain saw novice and need guidance or unable to choose between two similar products, you can chat with us online or call one of our technicians today. Setting up and starting a chainsaw can be extremely difficult for beginners, but this guide enables you to approach this on a step-by-step basis. If you have a garden strimmer, you probably don’t realise how versatile this tool is. Read this guide to discover five of the jobs it can take care of. If you’re new to gardening, this beginner’s guide will highlight the best and most effective tools for completing outdoor tasks. Learn the best way to cut down a tree with SGS Engineering, including how to do it safely and the best tools to use.